Cats is coming to the big screen as the movie adaptation of the award-winning musical has officially begun filming. Universal Pictures made the announcement recently, revealing the first set photo as production kicked off in London. Director Tom Hopper is at the helm for the movie adaptation of one of the most successful Broadway shows of all time. In addition to announcing that filming is underway, the studio also announced the full principal cast for the movie. The cast includes James Corden (Bustopher Jones), Dame Judi Dench (Old Deuteronomy), Jason Derulo (Rum Tum Tugger), Idris Elba (Macavity), Jennifer Hudson (Grizabella), Sir Ian McKellen (Gus), Taylor Swift (Bombalurina), Rebel Wilson (Jennyanydots). Audiences will also be introduced to newcomer Francesca Hayward (Victoria), who was previously a principal dancer with The Royal Ballet before making this new transition into acting. The studio also promises that the production will include many world-class dancers, such as Larry and Laurent Bourgeois, aka the Les Twins, Tony-nominated stage actor Robbie Fairchild and Mette Towley, a member of Pharrell Williams' dance group, The Baes. 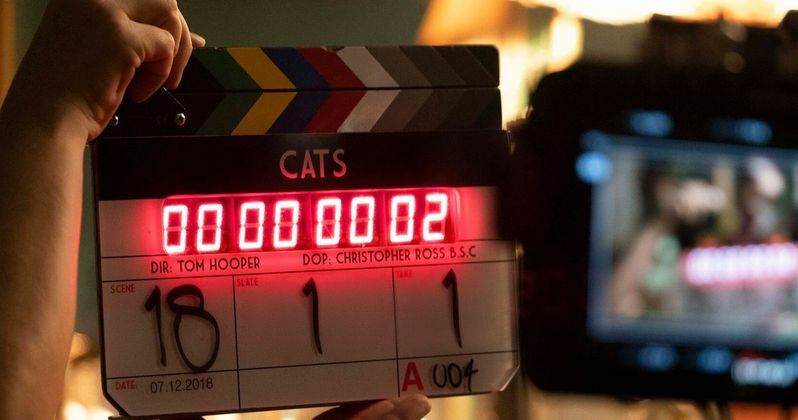 Tom Hooper, who previously helmed Oscar-winners such as The King's Speech and Les Miserables, is going to be using "astonishing new technology" in order to turn the cast members into felines for the movie. Other key members of the production team include Oscar-nominated production designer Eve Stewart (The King's Speech), cinematographer Christopher Ross (Terminal, Room), Oscar-nominated costume designer Paco Delgado (The Danish Girl), Oscar-winning sound mixer Simon Hayes (Les Miserables), BAFTA-winning executive music producer Marius De Vries (Moulin Rouge) and casting director Lucy Bevan (Murder on the Orient Express). Cats has been destined to be brought to the big screen for quite some time. The musical is based on T.S. Eliot's collection of poems, Old Possum's Book of Practical Cats. In Andrew Lloyd Webber's musical, a tribe of Jellicle Cats on a moonlit evening must make the "Jellicle choice" to decide which of them will ascend to the mysterious Heaviside Layer to be reborn. Cats remains the fourth-longest-running show in Broadway history. Prior to 2006, it was the single longest running, holding the distinction for nearly a decade. The wildly popular musical, which has been performed nearly 9,000 times over the years, was awarded seven Tony Awards in 1983, also taking home a Laurence Olivier Award not once, but twice, in 1982 and 2015. In addition to having Tom Hooper at the helm, Steven Spielberg is on board as an executive producer, which certainly doesn't hurt matters any. Spielberg, coincidentally, has a major musical in the works himself, as he's preparing a remake of West Side Story. Also producing are Tim Bevan and Eric Fellner and Debra Hayward for Working Title. Cats is set to arrive in theaters on December 20, 2019, right up against Star Wars 9. They're apparently hoping to succeed as counterprogramming for those who aren't interested in a galaxy far, far away. Be sure to check out the first set photo from the Universal Pictures Twitter account below.